HOUSTON, TX--(Marketwired - Jan 15, 2014) - CAMAC Energy Inc. ("CAMAC") (NYSE MKT: CAK) announced today that a long-term drilling contract has been signed with Northern Offshore Ltd. (OSLO: NOF.OL) for the drillship Energy Searcher. The rig is expected to be delivered to the Oyo Field in OML 120 offshore Nigeria to commence drilling activities in the first half of 2014. The signed agreement covers an initial period of one year, with an option to extend the contract for an additional one-year. 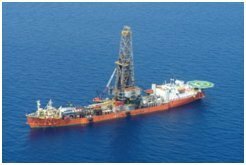 The Company plans to utilize the rig on its multi-year, high-impact development and exploration portfolio. The Energy Searcher's capabilities include drilling to total depths of up to 25,000 feet, and in water depths of up to 2,500 feet. Kase Lawal, Chairman and Chief Executive Officer, commented, "We are pleased to have executed the rig contract with Northern Offshore, which builds on our relationship, and ensures a highly capable and efficient rig to execute on our transformational development and exploration program in 2014 and beyond." CAMAC Energy is an independent oil and gas exploration and production company focused on energy resources in Africa. Its asset portfolio consists of 8 licenses in 3 countries covering an area of 41,000 square kilometers (~10 million acres), including production and other projects offshore Nigeria, as well as exploration licenses offshore and onshore Kenya, and offshore Gambia. CAMAC Energy is headquartered in Houston, Texas. For additional information, visit www.camacenergy.com.